I've had some Halloween-themed fabric hanging around my sewing room for ages. Since I wasn't sure how ready I would be to sew after my cervical fusion surgery, I didn't really plan on doing much of anything, let alone sewing. But lo and behold, I found the energy (either that or the Vicodin is working really well) to make something smaller than a quilt. I found these cute trick or treat bags and an online tutorial to go with them so I thought I would give them a try. 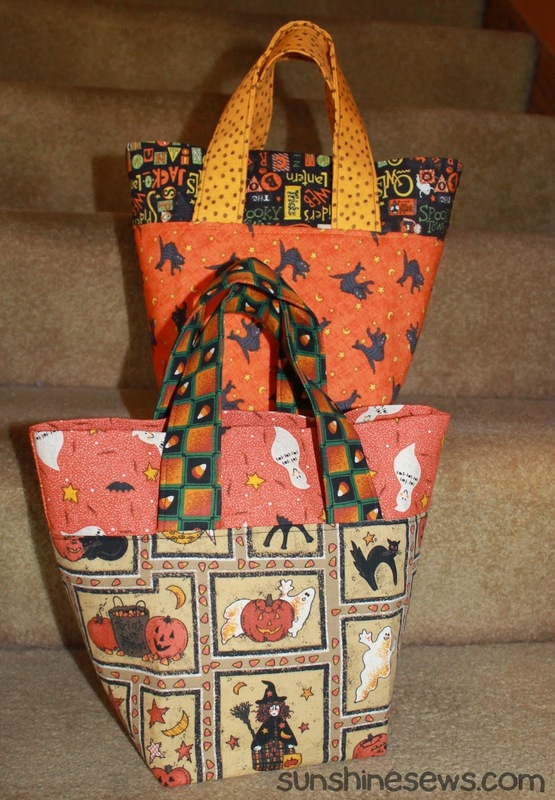 I dug out my Halloween prints and my fusible interfacing and got started on some trick or treat bags. The instructions were easy to follow and even though my lack of strength made it a little difficult for me to work with all that interfacing, I must say it was totally worth it. These bags are exactly as described, they close up nice and when you open them up wide, the sides stand up nice. I can already picture how nice it will be for the people in my neighborhood to easily toss candy right into the bag. I hope my granddaughters like them. Unfortunately, the fabric combinations look much better (like they actually go together) in natural light than they do in the photo. I found the tutorial for them here if you would like to make some too. Thank you so much for the encouragement and the wonderful tutorial.